I am 21 weeks and 3 days pregnant. 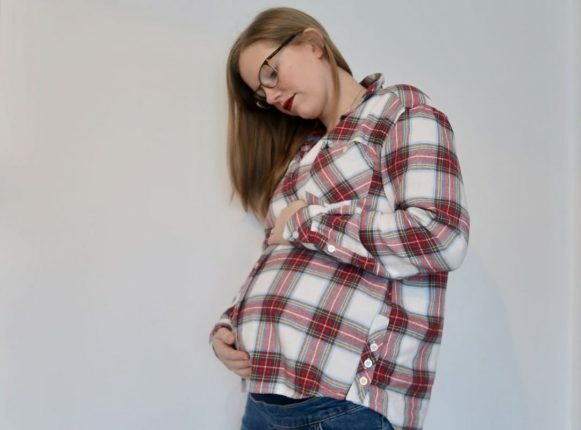 Firmly into the second trimester – and still throwing up. 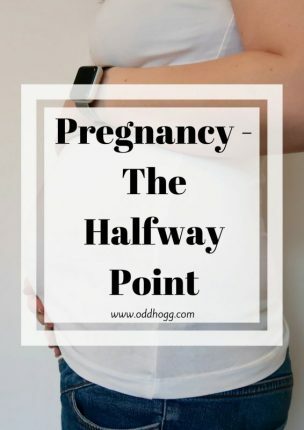 I have passed the halfway point in this pregnancy and I’m not really sure how! From around 7 weeks pregnant until about 17 or 18 weeks I was being sick every day, multiple times usually. I was miserable and just about surviving day to day. The first half of pregnancy hits me hard, more so this time as I had Piglet to look after and keep busy too. We have made it through it though – and now I’m on to bigger and better things as the count down to baby starts! Now that I am 21 weeks I have had my detailed scan. JHogg was able to come with me to this one which was great at as he couldn’t make it to Piglet’s one. Baby was being a bit of a pickle. He had his bum down and was folded up a bit like a deck chair. He made it pretty difficult to get some of the measurements but we got there in the end! A few weeks ago we also had a gender scan. I popped a full gender reveal up, but as I’m sure you’ve already worked out from the use of “he” above – we are having another little boy! It took us a few minutes to come around to the idea but now we’re very excited to add another little man to our house! I have another scan in just over 3 weeks time. It is just a standard growth scan to make sure baby is still on track. There is a risk with diabetics that the baby’s abdominal circumference can be larger than average, and if that becomes the case then I will be induced early. There are no concerns so far though so I’ve got my fingers crossed that the rest of the scans will follow suit. Aside from the morning sickness, I’ve been treated to sciatica this pregnancy. It is not something I had last time so I was a bit surprised when it showed up around 14 weeks. I thought it was easing off….. but no it’s definitely in full swing still! I was suffering quite badly with heartburn and indigestion too, but thankfully that seems to have gone for the time being. I was taking Ranitidine to help with it, but it didn’t really make much difference to be honest. I am bracing myself for it to return in the third trimester when things are a little more cramped in there! My skin has been absolutely awful to say the least. I have never had so many breakouts in my life. I am trying all sorts, but my skin is just dry and spotty. I would love to hear any tips if you have them! I am still very tired. I don’t quite need a nap every day any more, but appreciate a lie down 2 or 3 times a week for a few hours. It makes the rest of the week that bit more bearable! Honestly, I’m not very happy with my diabetes in this pregnancy. I haven’t felt motivated to control it as well as I really should have and the results reflect that. My hbA1c has risen to 52 (6.9%) which, although is still within the target for pregnancy, is far above what I consider an acceptable level for myself or my baby. I’ve taken action and made some changes to pump settings to see if I can get my act together a bit and make sure baby doesn’t suffer as a result. Insulin resistance is now setting in, and my total basal has risen from around 14u a day to 19u. I will continue to see that rise throughout the pregnancy until the day baby is born. It is taking some getting used to as I sometimes forget and don’t put enough insulin in the pump and end up having to do a set change more regularly than I’d like! As with my first pregnancy, I have an anterior placenta. This means it is right on the front and cushions most of the baby’s movements. Before our gender scan at 19 weeks I couldn’t feel anything, but suddenly the next day I was very aware of lots of movement. I think that is largely down to baby’s position. In the gender scan he was head down and kicking my placenta, so I didn’t feel it, but he had moved and was kicking my side in the detailed scan 2 weeks later and I think that made all the difference. I know from last time that as he gets bigger I will become more and more aware of him and soon enough his movements will be very noticeable all the time. At the moment it’s nice to just have those occasional reminders that he’s there and happy though! At the moment it is mostly just a waiting game. I am seeing the community midwife again in a few weeks, where she will organise applying for my baby box (I love that we get these in Scotland now!) and I see the consultant a week or so after that. As things stand, we are currently still planning on going ahead with an induction at 38 weeks. That is still a long way off though and a lot can change in that time, which may mean an earlier induction or a c-section depending on the health of both me and baby! Fingers crossed all will continue as planned. I have fortnightly updates over on my YouTube channel if you want to hear more about how I’m getting on – but I will try to update on here too if anything major or exciting happens! Eating Out – What Constitutes A Kids Meal?